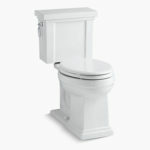 The Kohler Devonshire K-3837 is a wonderful, elegant toilet that will bring an old-style feel to your bathroom. This toilet not only looks the part but it is also powerful, water efficient and suitable for a wide range of people. As you can see, the Kohler Devonshire has a traditional design and it’s no wonder this model is one of Kohler’s most popular toilets. If you like the look of this model, then I hope this Kohler Devonshire toilet review will help you decide if this toilet is the one for you. This toilet is taken from the Devonshire collection and compared to similar classic looking toilets in the Kohler Memoirs collection, this one is a little less sharp in design. The tank does have a square shape but the round centre makes it that little bit softer. Kohler describes this design as a tribute to the bygone era and wants to give a more traditional feel to this model. This toilet would not look out of place in a period drama or a country manor. It is a two piece toilet with a sturdy, solid base. It is also a Comfort Height toilet that is ADA compliant and more comfortable for a wide range of users. A Comfort Height toilet is roughly 2 inches taller than a standard toilet and compares well in size to a regular kitchen chair. Comfort Height seating will benefit people that find it difficult to stand up or sit down, such as the elderly, disabled or people recovering from surgery. A Comfort Height toilet and ADA Compliant. However, it is worth noting that a Comfort Height toilet may not be as comfortable as a standard toilet for very short people and small children. The Kohler Devonshire is available in a wide range of colors that should match any bathroom decor. Colors: Almond, Biscuit, Black, Ice Gray, Sandbar, White. Using gravity force and the AquaPiston canister, the Kohler Devonshire provides a powerful flush that flows water throughout the whole rim. This 360° flush will ensure an effective and thorough cleansing of the toilet bowl each and every time. The durable AquaPiston canister design exposes 90% less seal material compared to a 3″ flapper, ensuring a leak free performance. Older two-piece models had a tendency to leak, so any new technology that will prevent leaks is very welcome. The Kohler Devonshire uses 1.28 gallons per flush. 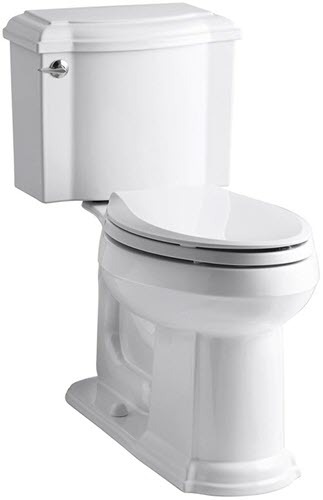 It is a WaterSense certified toilet and will use 20% less water compared to a 1.6 GPF toilet. However, if you are upgrading from an older standard toilet then you will save even more water. You will use an amazing 16,500 gallons less water per year by using this model. Of course, WaterSense certified toilets are not only great for the environment but they are also great for saving money on water bills. The Kohler Devonshire toilet is WaterSense Certified, using 1.28 gallons per flush. Installing a two-piece toilet is not that difficult. A person with limited DIY experience should be able to install the Kohler Devonshire themselves. Of course, you will need the strength to lift the separate toilet parts but as it is a two- piece toilet, you will be able to install the bowl first and then connect the toilet tank afterwards. This will make installation a little bit easier and lighter, compared to installing a one-piece toilet. Kohler have made it even easier to connect the toilet tank to the bowl, with a 3 bolt locking system that is very easy to install. It will also connect the bowl to the tank very tightly, making it more difficult for bacteria and dirt to accumulate in the crevice. The Kohler Devonshire is no doubt an elegant toilet, so it is important to compare it to a model that matches not only its looks but also its powerful and water efficient performance. The toilet that I believe compares well to the Kohler Devonshire is the Toto Promenade II. The Kohler Devonshire design has a classic, old-style feel to it. Its square tank with a round front is quite different to other toilets that are usually either quite sharp or very smooth. However, the Toto Promenade II has a very similar appearance with a square tank with a round front. So far these toilets look very similar and both look very stylish. Both toilets are ADA compliant and are suitable for a wide range of users. Kohler’s very own Comfort Height and TOTO’s Universal Height are more or less the same thing. Both make it a lot easier to use the toilet, for not only tall people, but also elderly, disabled and people recovering from surgery. The Devonshire and Promenade II use a mere 1.28 gallons per flush, 20% less than a 1.6 GPF modern toilet. This makes them both WaterSense certified. The Kohler Devonshire uses AquaPistion Technology to provide a powerful and efficient flush. Where as the Promenade II uses Toto’s own Tornado Flush System. These two brands are two of the best in the business, so you can expect you will get a well performing flush from both toilets. Both toilets are WaterSense Certified and ADA Compliant. The main difference between these two is that the Devonshire is a two-piece toilet and the Promenade II is a one-piece. Does this matter? Not really. It is a personal choice whether you prefer a one-piece to a two-piece, however there are a couple of minor differences. First of all, installing a one-piece toilet by yourself may be more difficult because it will be heavier. If your back can handle lifting a 100 lbs toilet, then that won’t be an issue. Secondly, two-piece toilets have a tendency to leak compared to a one-piece. This is due to the the tank and bowl being separate. However, this also shouldn’t be an issue because of Kohler’s modern technology that provides a leak free performance. Therefore, you will never have to worry about the Devonshire two-piece leaking. Thirdly, two-piece toilets are a little bit harder to clean. Dirt and grime can accumulate over time in the crevice between the tank and the bowl. This means a little bit extra maintenance compared to a one-piece toilet. And finally, a one-piece toilet is generally more expensive compared to a two-piece toilet. Overall, the Kohler Devonshire and the Promenade II are elegant and stylish toilets that will add a classic feel to your bathroom. They both have a powerful flush and only use a very water efficient 1.28 GPF. However, it is not surprising that the one-piece Promenade II is more expensive. If price is an issue, then the Devonshire is a better choice. If you prefer a one-piece toilet, then the Promenade II is better. However, no matter which one you choose, you will have a very stylish, elegant toilet in your bathroom. If you would like to see a detailed review of the TOTO Promenade II with images and videos, then check out the full review here. Looking at this elegant, traditional style toilet, it is easy to see why the Kohler Devonshire is so popular. Its design is a tribute to old style toilets and will add a lot of class to any modern bathroom. 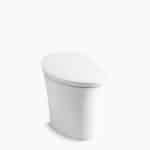 It is a powerful toilet that is water efficient, using only 1.28 GPF. It is WaterSense certified, environmental friendly and should save you a lot of money on water bills, over time. The Devonshire is also a Comfort Height toilet and is roughly 2″ taller than a standard toilet. This will make it a lot more comfortable for a wide range of users. I hope you found this Kohler Devonshire toilet review helpful. I also hope you are now able to make a more informed decision on whether this classy looking toilet is right for your bathroom. If you have used the Kohler Devonshire toilet before, please let us know. Also, if you have any further questions on this model or any other Kohler models, leave a message in the comment section below.